In the past, several reports on terrorist attacks have indicated that jihadists shouted the same cry to clearly let the world know about their motivations. “During the Charlie Hebdo attack, terrorists shouted ‘Allah Akbar’! We avenged the Prophet,” was the Figaro’s headline after the attack. The CBC reported that Xristos Katsiroubas, from London (Ontario), and his accomplices shouted ‘Allah Akbar’ when they attacked a gas plant in Algeria in 2013. In Nice, the terrorist who mowed pedestrians with his truck shouted ‘Allah Akbar.’ The CBC reported that a witness of Michael Zehaf-Bibeau’s attack on the Canadian Parliament in 2014 told police that he thought he heard him yell ‘Allahu Akbar.’ Farah Shirdon left Calgary to join the Islamic State. In a propaganda video in which he relays ISIS’ threats to attack the U.S., Shirdon is accompanied by a group of jihadists. While he is tearing his Canadian passport into pieces, burning it, and stamping on it, those who are with him are shouting ‘Allah Akbar,’ etc. Invited to comment on current news in her weekly appearance on the Maurais Live show broadcast by CHOI Radio X in Quebec City, author and columnist Denise Bombardier recalled that ‘Allah Akbar’ “is the expression being shouted by all those involved in [terrorist] attacks. It’s the expression that identifies them. It’s their signature.” She added that she was ‘flabbergasted’ and ‘stunned’ to hear Philippe Couillard use an expression with such a deep resonance. The portion of Denise Bombardier’s intervention dedicated to Premier Couillard’s ‘Allah Akbar’ cry starts at 12:10 in the audio. In French. 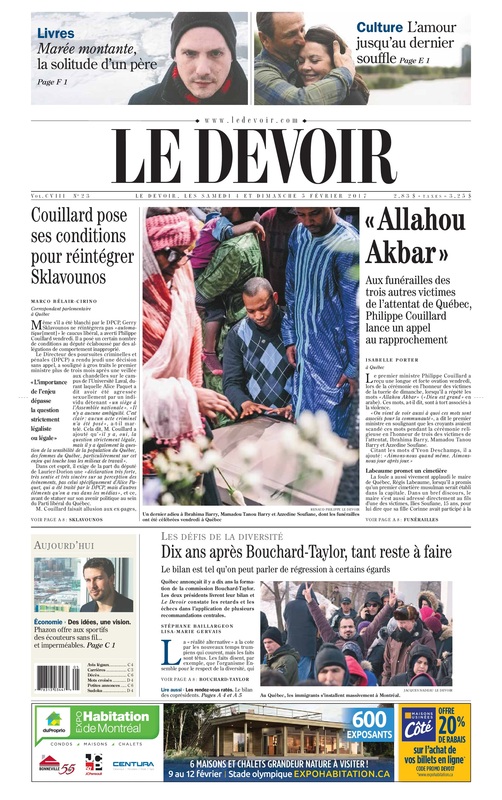 In 2013, an official Saudi newspaper reported Philippe Couillard’s endorsement of the Saudi king. Richard Martineau commented on the issue. In 2011, while Philippe Couillard was a member of the Security Intelligence Review Committee supervising CSIS’ activities, the National Post reported that he was being paid to advise the Saudi government.